Matthew J. S. Aaron, Jr. was born in Newark, NJ. Raised in the inner-city community of Irvington, N.J, Matt was raised by his parents who worked countless hours to build a foundation for him and his sister. Growing up, Matt always had an entrepreneurial spirit and a passion for helping people see their dreams become a reality. He went to St. Benedict's Prep High School which played a huge role in his success and the mindset he developed to never quit. 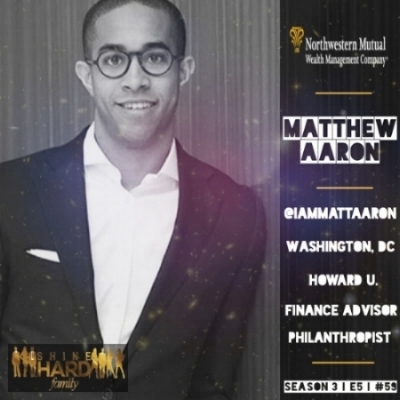 Matt went on to Howard University School of Business where he developed as a professional and helped him to shine to be the diamond he always was. He leveraged his relationships at Howard and relationship with a corporate sponsor, Northwestern Mutual. Through many obstacles, Matt was appointed a contract with Northwestern Mutual where he had the opportunity to start a financial planning practice while in college. Matt was blessed to have many mentors he sought out to help him build a strong practice. Matt now runs a successful financial planning practice where he advises physicians, attorneys, and other professionals across the country. He has a passion for working with what he would call the “emerging affluent market”, those who have a lot of potential to make significant income in their life. Lastly, Matt loves giving back in many ways. He started a non-profit while in school that focuses on educating our youth on entrepreneurship. Along with his efforts speaking to the community at various schools, Matt brings a unique perspective to his industry and the #ShineHard Family. We introduce a financial phenom with a passion for service and clarity for the future. Matt: I grew up in the inner city of Irvington, New Jersey, right next door to Newark. So, if people know what Irvington and Newark is like, it’s not the easiest place growing up. I had a lot of different challenges, obstacles I had to face and overcome, but it built me into the man that I am today. I certainly appreciate those experiences. I had both of my parents, definitely full support and my parents worked so hard to help me get through that. It was an interesting journey, growing up in an inner city. My high school, St. Benedict's Prep found the cure for how to get inner-city kids out of the hood and had an 80% graduation rate. Matt: Farrah Gray. He is the first African American kid who became a millionaire at 14 years old. He sold syrup, maple syrup, pancake syrup (laughs). It was cool to learn his story and how he got to where he was. He was so young and has to navigate through the tough relationships to complete his projects. That really inspired me to know what’s possible. When did you know that you wanted to be a financial advisor? Matt: I kind of fell into financial advising. I’ve always been an entrepreneur since I was little. I love generating capital and I also love helping people accomplish their goals. I tie in all these pieces and I’m like, “what career looks like that?” I talked to a number of different people and I went to my mentor. I learned about what he did and our stories were similar, Leo Tucker owns like 5 different offices. He’s the type of pro you see and think, “I want to be like THAT guy.” So through that, I learned the whole role of the financial advisor and I wanted to start my practice when I was a freshmen in college. Some people told me that there was no way. Clearly they had no idea of my mindset because I didn’t really take that as a no. I went and figured out a different strategy and how I was going to get there. I went an interned at their corporate office in Wisconsin. Everyday, breakfast and lunch, I met with somebody else in the company until I made it to the CEO. After a conversation on the golf course, they called my mentor down in DC, I showed him my business plan and he contracted with me on the spot. How do you acquire new clients? Matt: I look at my clients in two different ways- those I’m investing in and those who have already made it. A lot of my clients are physicians, attorneys, and business owners. Physicians and attorneys, when they first come out of school they have a boat load of student loans and physicians coming out of school are going into residency and not really making much money. I talk to them about the principles of finance and protecting the ability to go to work. We also can look into ways they can invest while they’re young where they actually go into higher tax bracket. There’s a common theme that that group is not the best with money, but they know that. I love working with them because when you develop trust, there is opportunity for long lasting relationships. How do you combat being a young advisor in the industry? Matt: I figured out how to navigate through that. When I first started my practice, I had partnered with guys who had gray hair. So having someone at the table with gray hair is nice, but then I started to develop this sense of confidence. I’ve always been confident, but now I’m really confident and I know what I’m talking about. I learned to ask the right questions and that humbles people. It’s about challenging and educating people. I love it. Matt: Some charge you $2,500-$5,000 just for the plan. You have some that get paid on commissions. You have some that get paid based on fees and you have some who do a combination of all of them. We do a combination of the whole deal. It depends on what the client wants, so if someone is early on in their career, it doesn’t make sense for me to charge them a fee, in my opinion. Of course I don’t run a non-profit, but it’s a business model that I created and if I know that person is going to do awesome in their career, why wouldn’t I invest in them and I build trust? Matt: My passion is around challenging myself and others and continuing to make success moving forward. There’s no such thing as a perfect life. You have to be patient for what you want, nothing is ever perfect but, “how do I help someone continue in progress?” is my passion. Whether it’s my goals or whether it’s my client’s goals, a friend’s, family- whoever I’m engaging with. I want to help you to make progress and continue to move forward. I knew ever since I was little. I’ve always been the captain of my team or something of that nature, challenging people, like I always challenge my friends, like c’mon, think bigger! What is the hardest thing you’ve ever done and why is it important? Matt: I went to a wrestling camp in Minnesota. It’s the hardest camp in the country. 28 days intensive sweat, blood and tears, high school. I was terrible. I went to St. Benedict’s and we all know St. Benedict’s basketball is an awesome team. I knew I wasn’t playing basketball, so I had figured something else out. I was in the locker room fooling around and I threw this kid and the wrestling coach was like, “I’ll see you at practice” and ever since then, I was at practice. I’m at this camp and the last day we had to run 15 miles. We would run with people on our backs, bear crawling... it was crazy. So much sweat you could literally slide across the mat. This was literally the hardest thing that I have done but it challenged me to know that I can always push further. I never thought I could run fifteen miles straight. I can probably run two miles now, but if someone challenged me I could push further. When I came back after that summer, nothing was stopping me. What type of challenges do you face in your business? Matt: Well, a lot. Everyday you’re encouraging clients to make the smart decisions, for the things they don’t want to do, but know they should be doing. I have to challenge people everyday. Also, managing the team, making sure they’re being effective, managing myself. It’s different when you’re in a 9-5 and you know your paycheck comes regardless. Knowing okay, even if I took today off, it probably won’t make a big impact. Everyday is a big impact for me. I’m grinding day in day out. That’s a challenge for me because of those days when I don’t want to work, Some people don’t believe that, but I have those days and those days I have to push myself! It’s about challenging my client, challenging myself, and challenging my team to continue to get better. Then also managing the budget, I have to pay my team and they’re not cheap (laughs). They’re talented and smart. Matt: Clarity, I have a lot of clarity about what I want and where I’m trying to go. The first thing is, I want to create generational wealth. You have to be strategic and you can’t be selfish, so there are things that I do now that I already know guaranteed that my family is going to be better off. It’s a guarantee that based on what I do, that when I die, a million dollars will transfer to my next generation. For me to know that I’m close, but that’s not enough for me. You can’t create generational wealth with just one million. I got to do a lot more. Also buying a full service firm where they’re building other advisors, which is exactly what my mentor does, contracting with them. Following his footsteps. I’ll probably buy him out when he retires. First, Better, or Different. How do you aim to become successful? Matt: I can’t say I’m the first to do it. I know I’m not the first, but I may do something unique in my practice that someone may have not done, I’m not sure. But there are definitely terms of enhancing, I’m all about that. I learned from a lot of different advisors in my life and I always kind of piece a little of what I like from them in their process and I’ll put it all together and create my own and it made me a better advisor. I’m so young and I started my practice young, I don’t have to necessarily make money in every conversation I have. I can invest in someone who I know will do well, versus someone who is older and has bills and kids, etc. What Advice do you have for young financial advisors? Matt: You have to genuinely care about your clients. You have to ask the right questions and you need clarity on where you’re trying to go. This is not an easy business. You are going to face some people who don’t believe they need help. You’re going to face that adversity every single day. You have to trust yourself, your team, and your dedication to the craft.